Let me start this ride report by saying that it was an honor to ride for and help raise money and awareness for ALS. Reminding myself what I was riding for was the only thing that kept me going during this ride. The account of the ride that I am about to write, is in no way a complaint about the ride. Given the exact same circumstances I would happily do the ride again. Next year I will be much better prepared. SO, the day before this ride I did a 64 mile ride along the New England coast from Newburyport, MA to Kittery Point, ME and back. The temp was a little cooler than I expected, but I figured that was because I was right on the water, and it was windy. This coordinator for the ALS ride sent out an email on Friday that mentioned the forecast was for 73 degrees and sunny. Dress accordingly. I figured with 73 as a high, lower to mid 50’s should be ‘roughly’ the overnight temps, and once the sun came out, and I was on the bike, I’d warm up pretty quickly. A base layer, a short sleeve jersey, shorts and arm warmers should be fine. I expected I would be chilly at the start, but would soon be removing the arm warmers. WOW, I could not have been more wrong. I did not know the actual temperature at the time, but it was teeth chatteringly cold. At 6:00 a.m. I registered at the tent, got my bike together and sat in the car to stay warm. I looked around and saw that a lot of other riders had softshell jackets and much warmer attire than I did. What did they know that I didn’t? Well, they were all the local riders that had their entire cycling wardrobe at their disposal. I only had what I brought with me (based on a much higher temperature). I should have bought more. As I approached the starting line with the others, I kept repeating in my mind… “Rule #5… Rule #5… Rule #5…” trying to summons my inner Jens Voigt. (For those unfamiliar with the reference Rue #5 please see http://www.velominati.com/the-rules/) It was not working, I was cold. 7:00 came and we were off. We took a right turn out of the parking lot onto a nice downhill. GREAT, now I can add wind chill to my already cold body. I have never prayed for an uphill so much in my life. The course made a sharp right turn at the bottom of the hill, and there was a volunteer that was supposed to be making us aware of the right hand turn. However, she was too frozen to do that, as she tried to get every last ounce of heat from the coffee cup she was hugging. So the first 8 people missed the turn, I was number 9, so I followed them. I looked in my rear view mirror and saw no one behind me. 5 seconds ago there were 80 people there… now no one. I stopped, looked at the cue sheet and sure enough, we missed the turn. The other 8 people didn’t realize it, so they kept going. I turned around and got back onto the course. So the group that was behind me was now in front of me, and the other 8 people that missed the turn are now going to be behind me. I am riding alone, which for me, is actually my preference. My plan to have the sun come out and warm things up was thwarted by the heavy tree cover on the route. My ride on Saturday was wide open, right along the ocean, plenty of radiant heat from the sun. This ride was on the back roads of rural Massachusetts. There was a FULL canopy of old pines, oaks and even a few chestnut trees (I know, because I tried to avoid the prickly pods that the chestnuts come in). So the best I could hope for was filtered sunlight. At all of the rest stops, the groups of people did not huddle around the food (peanut butter and jelly, banana’s, pretzels, goo gels and ICE water and COLD Gatorade) they huddled in the spots of sunshine. The scenery on the ride was very nice and the back roads had very few cars on them. The course was hillier than I anticipated. The beauty of riding alone on a hillier course is that there is nobody’s pace but my own that I had to worry about. Because of this, I did not mind the hills at all. My knees over the past few days were not so excited about them, but they are better now. All in all, it was a great ride. I did check weather underground and found that the temp at the start of the ride was 33.6 degrees. In shorts, a short sleeve jersey, arm warmers and a wind breaker that was pretty cold, but like I mentioned at the start of this report, given the exact same circumstances I would do the ride again in a heartbeat. Thank you for all that donated. On Saturday I rode perm # 2364 Coastal Cruise (east). It is a 103k perm from Newburyport, MA to Kittery Point, ME and back. The route covers 3 states (MA, NH and ME) and runs right along the scenic New England Coast. I was in New England to a charity ride on Sunday (ride report to follow) so I wanted to do the 100k to work towards the RUSA American Explorer award. I nearly did not finish this ride because of my own arrogance. I arrived at the starting control with plenty of time to get my bike out of the vehicle, put the front wheel on it, put the Garmin on it, water bottles etc. But instead, I waited in the car because it was cold. The forecast tem was to be in the mid 50’s… it was 45 with a breeze coming off the water. “It’s only 100k, and I have nearly 7 hours to complete it…I’ll be fine”. I bought the requisite banana and water from The Plum Island Coffee Roasters at 7:01. I walked back to the car to put myself and the bike together. It was cold and windy, but I brought a newspaper from the hotel to help block the wind from my body. So it was base layer, USA today, short sleeve jersey, arm warmers and wind breaker. I pushed off to start the ride at 7:30. I figured, no problem… 6 ½ hours for 65 miles, I’ll be fine. As I headed to the ocean front, I could feel the wind blowing me towards the curb. I knew, in order for the wind to be able to move me, it had to be pretty strong. I also knew that as soon as I made the left hand turn at the ocean front that the strong wind would be directly in my face. I tried to judge the wind speed based on the flags on the flag poles. I saw somewhere on the internet that you could do this, but I am apparently not real good at it. I estimated the wind speed (based on the flags) to be between 10 – 15 mph with gust of up to 20 mph. Based on how I felt trying to pedal into that wind, I estimated t at 50 – 60 mph sustained. (Weather underground had the winds between 5-8 mph with gusts up to 12 mph). I was doing fine despite the wind. The sun had come out and I had warmed up rather nicely and I had some beautiful scenery to take in while I rode. For some reason I started thinking about y control card. I knew I had it with me (that is always a fear of mine). I thought about how long it had been since I had a control card and how this one was a little different, because the open and close times of the controls were “running times” after your departure. OK, so the first timed control closed at 2:28. Doing the math, that meant 9:28, but 30 minutes of that time had been wasted. With the head wind, I was not making great time. I did the math in my head and I figured that I was NOT going to make it. Fortunately, the route took me away from the ocean and into some roads that had trees and shelter to block the wind. I was able to make it to the first control with 5 minutes to spare. I quickly grabbed a bottle of water and hit the road again. The next control, the turnaround control, in Kittery Point is very familiar to me. I lived there while in the Navy and this area is where my oldest daughter was born. It is amazing how things have changed there. I made it to the control, turned around and on my way back, took a little detour to the apartment in Navy Housing where we brought Amanda home to. It is fun to reminisce. The trip back to Newburyport took basically the same route. So, you guessed it. I made very good time getting back with the wind at my back. I would be riding at a nice easy pace and look at the Garmin and find that I was doing 20 mph. I was happy that I faced the headwind on the way out, so that the ride back was made much easier. I made it back to the Plum Island Coffee Roasters at 12:30. It felt good to a RUSA ride again. I am looking forward to the 100k in October. For those of you who have been checking this blog during my absence, I appreciate your persistence. The final semester of school was reading intensive, and for someone who does not read very quickly, it required me to devote much more time than I would have liked. Consequently, this blog became a casualty of my schooling. School is over, graduation is completed, work is busy, but I feel reasonably caught up on those things that were neglected while at school and I feel like a weight has been lifted off my shoulders. Sadly, it is from my mid-section that I need the weight to be lifted from. Yes, my physical health became a casualty of my schooling as well. The good news is that I know how to get that weight off. I have done it before and I am determined to do it again. I will post updates here as I go along. I apologize that this post is so short, but I just wanted to post something to let everyone know that I am still alive and doing well. WOW... my last post on this blog was June 1st. I knew it was a while ago, but not that long. Sadly, there is not much "bike" news that I can pass on. I have been neglecting my bikes, and it shows. It has been too hot over the summer... I have been too busy at work.... I stayed up to late to do homework... and the list of excuses goes on and on. All of them just that... excuses and justifications (in my own mind) to not ride. On Friday I was reading Mike's blog and came across a word that I had never heard before. "Coffeeneuring". Well, I clicked on the Coffeeneuring Challenge link on his blog and found the rules for a challenge that MG (a DC Rand rider) had created. "Coffeeneuring Challenge" rules as spelled out quite clearly on her blog, and it sounded like just what I needed, a challenge, to get my fat toucas back on the bike. In a nutshell, I have to ride to 7 different coffee shops (of my choosing) by the end of October. The coffee shops have to be more than a 2 mile ride, the rides can only be done on Saturday and Sundays and you can only visit 1 coffee shop per day. Well, you can visit as many as you want, but only 1 will count towards the challenge. The prize... the fun and exercise that you get doing the weekend rides is your prize. I am not looking at what I can get, I am REALLY looking at what I can lose. Maybe a couple lb's. I made my list of coffee shops and made a plan. Saturday morning came around and I got the bike ready to go. Air in the tires, lube on the chain, wiped off all the cobwebs and I was off. I actually put the bike in the car and drove to the B&A trail and rode to Java Diva's. 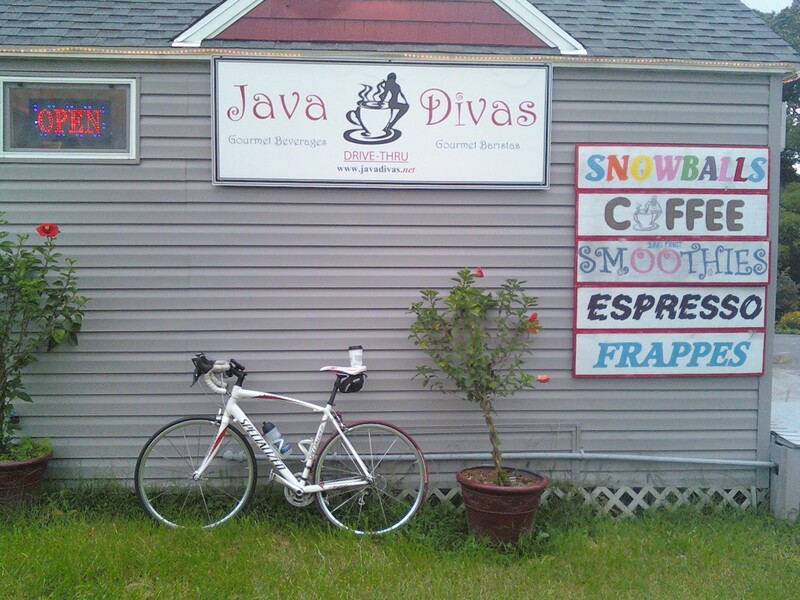 Information about Java Diva's can be found at their website Java Diva's . It ended up being a 16 mile ride at an incredible slow pace. On the way back to the car, I stopped at the Farmer's Market to meet Bev and get some good fall vegetables. It was a great ride, great weather and a great way to start the challenge. Sunday morning was the true test. Would I get up and ride again? The coffee shop on the list today was City Dock coffee in Annapolis. This would require me to ride over some mountains (OK, just a bit of a stretch, but after being off the bike for so long, I knew they would feel like mountains). I pulled myself out of bed and downstairs to check the temperature to see how to dress. 46 degrees. I had complained all summer that it was too hot to ride, I could use the excuse that it was too cold to ride. I dressed appropriately and off I went. This time from the house I rode to City Dock coffee and then back home. I have not seen the Garmin statistics for that ride yet, but it was 17 miles at a slow pace. Two down, 5 more to go. Next weekend I will knock out two more coffee shops and get a little bit more of my fitness back in the process. Thanks for reading and I am going to try to carve out just a little bit of time every couple days to do an entry here. Ok, so how do I wrap up almost months of not blogging into one post? It really won't be that difficult, because I haven't done a whole heck of a lot, which is a problem. The rainy season (March, April and May) has come and gone, and with rain comes a wealth of excuses why NOT to ride the bike. "It's too wet, It's too cold, If I ride in the wet I'll have to clean the bike completely and I don't have time to ride, let alone ride AND clean..." You get the picture. Needless to say, my miles are down significantly this year. So much so, that I will not even fill out a training log for January - May. Work has been a strain... but only because I let it be. Delayed roll out of new computers has caused other projects to get pushed back and back and back. I think I see the light at the end of the tunnel, so provided that the light is not attached to an oncoming train, I should be back to some sense of normalcy soon. I have ridden 4 times in the past 7 days, so things are looking up. Last Wednesday I took the day off to watch the Blue Angels perform. Bev had gotten tickets to the VIP tent, and since I consider myself a VIP, I wasn't going to miss it. Well, the Blue Angels decided to have a close call in Lynchgburg causing them to cancel the next few upcoming shows so that they could do a safety stand down and correct the problems that led to the close call. So, I took my bike and rode from home to the Rusty Bridge and back. On Saturday I joined the SPP bagel ride into Annapolis. A large group of riders came out for that ride because of the beautiful weather. On Sunday I rode with Mike and Bob around the Severn River with a detour out to Crofton for some Caribou Coffee. It was a nice ride at a nice pace with nice people. It doesn't get much better than that. Finally, this morning I joined the 5:46 group ride from the Rusty Bridge. I think there were 14 riders at the start. On Tuesday, Wednesday and Thursday the pace is very fast, but with a large group, enough people, for varying reasons, did not want to go fast. So 4 or 5 of us hung back and rode at a more moderate pace. I have not seen the difference in the scales yet, but I can feel the difference in my attitude and energy levels. I am hoping to ride the 5:46 ride again tomorrow. I'll let you know if I make it or not! For anyone who has gotten an email from me you may have noticed my signature line that says "Would the person who stole my motivation please return it, no questions asked!" This past weekend I had my motivation returned to me by two SPP members. On Saturday I managed to force myself to get my bike gear on and head out for a ride. I was leaving the house too late to make it to the starting point of the 7:30 ride on time, but I decided to head in that direction and intercept the group as it headed to Annapolis. Well, as it turned out I only saw Chip heading down the trail. I turned around and we headed into Annapolis to enjoy a nice leisurely ride, a hot beverage, and some good conversation. On my way home I realized that I have really missed the camaraderie that we have riding together as a group. Sharing a laugh, talking about whatever happens to be the topic of the day, or sometimes (for me anyway) sucking in as much air as possible and trying to hang onto the back of the group. That ride helped to return a portion of my motivation. I found a package of motivation on the side of the road, a little tattered, it had bite marks and dog spit on one corner, but otherwise it is intact and fully functional. I didn't know who it belonged to, so I kept it safe and took it with me for a ride every now and again to keep it charged up. I had it with me on our night perm in January and it really liked all the long hours and cold miles so I knew it belonged to an experienced randonneur. Yesterday it was really in its element and enjoyed the scenery and camaraderie of the group. It pulled me over the hills, and pushed on the descents, it waived to the ducks in the stream, and the horses in the pastures, and mocked the farm dogs behind their fences. It has been good company. I promised Dan that I would relieve him of my motivation sometime this week. Along with my motivation, Dan and Chip have returned my appreciation for the people that ride with SPP as well. So to answer the question "Why I ride?" it is not only to get my heart rate up and burn calories, but to spend some time with some great people who share a common interest. So it is the last day of January, and I just totaled up my miles ridden for the Severna Park Peloton mileage challenge. It was quite an embarrassing number. I could go on and on with the excuses about how cold it has been, and the snow and ice are not exactly the conditions that I want to ride in and the list goes on and on. The truth of the matter is that I have not had the motivation that I need to get out of bed and on the bike. Last year, I worked very hard to get in shape for the 550 mile ride through the mountains of New England in July. I had a goal. Something to work towards, and because I was registered and had solicited sponsors the help raise money for diabetes I felt that I had to ride those miles or be embarrassed in July. After the New England Classic was done, so was I. I thought it was just a "burnt out" feeling and a little bit of time off the bike and I would be right back to riding almost every day. But, the more days I didn't ride the harder it seemed to force myself to get on the bike and ride. Because I was working towards my R12, I still found myself riding some to maintain what little fitness I had left in order to ride the 200k's. So, here we are in a new year, and I have started the month out with an all time low for me in regards to mileage. I need a goal. A target to work towards. I am not going to do the 550 mile New England Classic again, but I am considering the shorter 150 mile version. The amount of money that has to be raised is much more manageable, and I won't have to take a whole week off from work to do the ride. I have my eyes on an event that I may possibly consider. I believe registration is in April and once I have officially registered, I will let everyone know what it is. So, stay tuned, for updates.